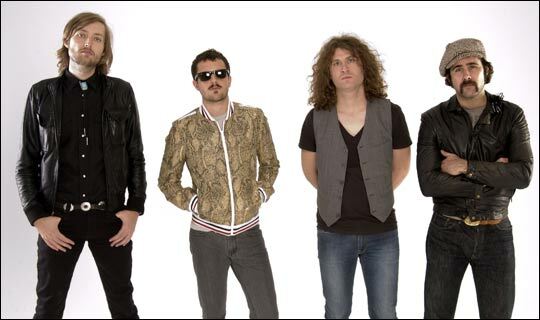 • STADIUM fillers The Killers have released their eagerly-awaited third album Day & Age. The Las Vegas band’s LP, the follow-up to 2006’s Sam’s Town, features the hit single Human. You can also catch the band live in the UK next year at dates in Birmingham and Nottingham in February and March. • Hip hop royalty Kanye West has released his fourth album, the ground-breaking 808s & Heartbreak. The album, which features the single Love Lockdown, is a change of direction for the rapper, who uses a combination of synth and vocoder on the LP to stunning effect. • Wish it could be Christmas every day? Then pick up your copy of Christmas Jukebox! The three-CD compilation features three themes to make every Christmas party go with a bang – a festive section, a rock selection and a further 20 tracks of pop. • Hot new band Burningpilot are driving into the charts with their debut album. The new LP, Cold Caller, is an arty slice of post-punk greatness akin to Franz Ferdinand. • Eighteen-year-old solo star Alessi’s Ark releases her debut EP, The Horse, on December 8. The release, a sophisticated, crafted preview of an up-and-coming talent, was produced by the team behind Bright Eyes. • British-born country pop singer Chilli Gold releases her debut album in January. Waterfalls, which features here current single Out Of My Mind, is available from January 12. • Described as “the folk-pop Ting Tings”, Oh, Atoms are set to release their debut album You Can’t See The Stars From Here next year. The whimsical indie-folk album, which features the single Sugar Mouse, is due for release on February 2. • If all this is music to your ears, why not log on to echoisaacashe.blogspot.com for more news, reviews and musings from the music world.